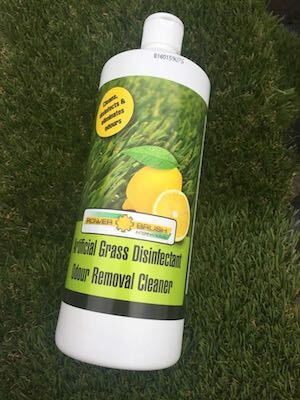 The Power Brush Artificial Grass Disinfectant Odour Removal Cleaner is formulated to clean and revive weathered or tired artificial grass surfaces. The cleaner powerfully removes urine, faeces and bacteria build up, as well as eliminating odours, leaving a refreshing lemon perfume. Always test on a small area before use to ensure you achieve the desired result. You should remove debris and moss, mould and algae using a stiff brush. Goggles, Wellingtons and waterproof gloves must be worn for all applications. The area to be cleaned should also be sealed off. Dilute 40 parts water to 1 part of the Power Brush Artificial Grass Disinfectant Odour Removal Cleaner. Apply using the sprayer with lance for close spraying. For best results, leave on for 15 minutes after application. Heavily stained areas may need a re-coat. Thoroughly wash off with water before dry. Retreat your grass monthly to keep it clean.